Tourists admire the colorful tulips on display in front of the Prince of Wales Hotel in Niagara-on-the-Lake, Ontario. The front of the historic Prince of Wales Hotel has a beautiful display of tulips. Tourists admire the colorful tulips outside the hotel. One of the tourists photographs the colorful spring scenery. A tree full of wonderful pink blooms sits just above the tourists. 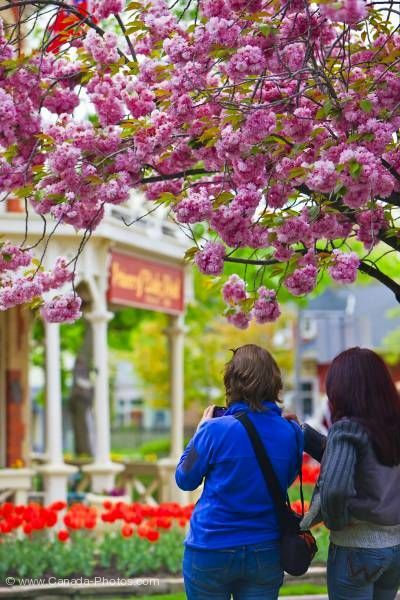 Tourists admiring the colorful Tulips, Tulipa, and the historic Prince of Wales Hotel (built in 1864), Niagara on the Lake, Ontario, Canada. Spring tulips in front of the historic Prince of Wales Hotel photographed by tourists, Niagara-on-the-Lake.